Record any audio - three simple words to explain Audio Hijack Pro. Record from applications like iTunes, Skype or DVD Player. Record from microphones, Radiosharks and other hardware. If you hear it, you can record it. 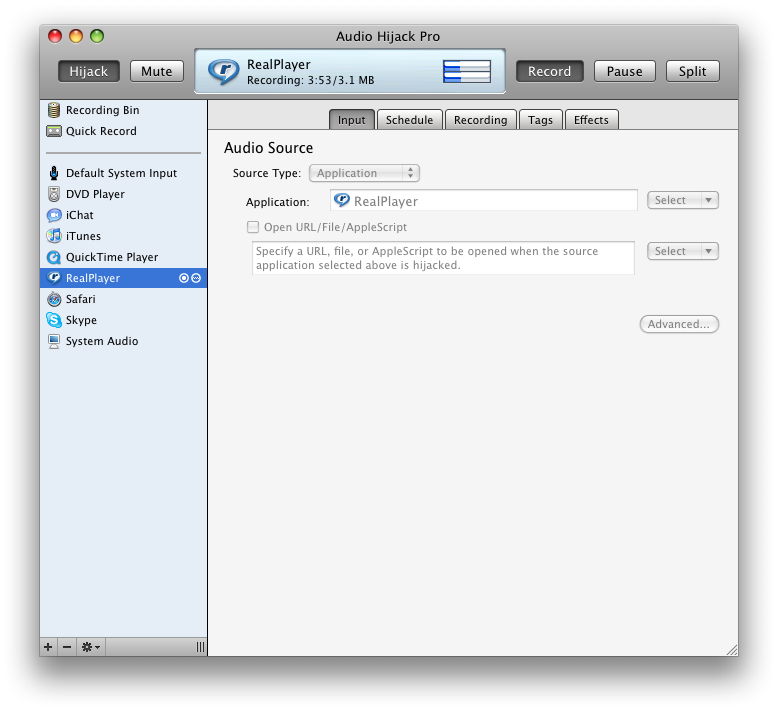 Audio Hijack Pro can record to the MP3, AAC, Apple Lossless, or AIFF audio formats. And Pull audio from DVDs and other movie files In addition to MP3, AAC, Apple Lossless, and AIFF, Audio Hijack Pro can now record to WAV. Record any audio - three simple words to explain Audio Hijack Pro. * VoIP Recording - A one-click call recorder for Skype or iChat? Yup! * Create Great Podcasts - Record microphones, Skype, iTunes and more into 1 file. * Record AM/FM Radio Too - Recording support for Griffin's RadioShark. * Record All Audio - Record all audio to one file with System Audio. * Digitize Your Analog - Bring tapes, vinyl records and more into iTunes. * Audio Device Recording - Pull from a mic, record player or any other audio device. * Pull It All In - Application Mixer pulls in audio from multiple apps. * Snack On Sound Bites - Pull audio from DVDs and other movie files. * Recording Options - Record to the MP3, AAC, Apple Lossless, or AIFF audio formats. * BulletProof Recording - Use MP3 or AIFF and never lose recordings due to a system crash. * Unlock Your Audio - Free yourself from the chains of restrictive audio formats and DRM. Qweas is providing links to Audio Hijack Pro 2.10.0 as a courtesy, and makes no representations regarding Audio Hijack Pro or any other applications or any information related thereto. Any questions, complaints or claims regarding this application Audio Hijack Pro 2.10.0 must be directed to the appropriate software vendor. You may click the publisher link of Audio Hijack Pro on the top of this page to get more details about the vendor.